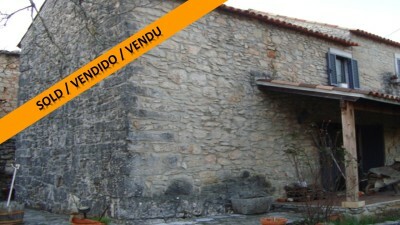 A one bedroom restored stone house with country views for sale near Penela, central Portugal. The house, which is set over two floors, measures 200 square metres of construction and is set on a plot measuring 400 square metres. The property is connected to both mains water and electricity and has aluminium framed double glazed windows with external shutters. The house has been restored to a high level, retaining all the character including exposed stone walls and wood floors and ceilings. The roof is new and it was all insulated with ( roof mate ) and retains all the rustic stile from the old days. Although the property at the moment consists only in one bedroom it is possible to incorporate two more decent size bedrooms quite easily. The main entrance leads in to the kitchen area, the kitchen at the moment is pretty basic but has the essential, it has a gas water heater, marble surfaces and exposed stone walls and wood ceilings . From the kitchen there is an archway leading to the living room. In the living room you have mixture of stone and rendered walls and wood ceilings and traditional terra-cota tiled floors. In this level there is a bathroom with toilet, shower and pedestal sink, the bathroom has a tiled floor and walls and wooden beamed ceiling. the Living/dining area, in this room there is a wooden staircase which leads to the second floor accommodation, there is also a corner, stone fireplace for heating purposes and a door leading out to the backyard . The wooden staircase off the living room which leads to a mezzanine area overlooking the living room. The mezzanine has wooden floors and ceilings and is being used by the current owner as a study area but is ideal to convert in more bedrooms, off the mezzanine there is a bathroom with shower, toilet and pedestal sink with tiled walls and tiled floor. There is also a double bedroom in this first floor , the bedroom is double aspect and the walls are rendered and painted ,and it has wooden floor and ceilings. The property is set on a plot measuring around 400 square metres and has good views over the countryside. To the front of the property there is a large covered patio with views to the pretty landscaped garden and to the country side. The larger town of Penela, which has a supermarket, shops, cafes and a restaurant, vet, pharmacy and all the day to day utilities, is around 7.1 kilometres (10 minutes drive) from the property. The historic city of Coimbra, which is home to Portugal’s oldest university, is around 30 minutes drive (27 kilometres). Coimbra has a range of shopping malls, restaurants, cafes, bars, shops and historic monuments and is popular all year round for tourists and locals alike. The closest airport to the property is situated at Porto, which is around one and three quarter hours’ by car. Porto airport is serviced by a variety of low cost airlines, which operate regular flights into and out of the United Kingdom and other European countries. Shaun Eke, formerly Northumberland, England Good website great service!